World's thinnest 3D Blu-ray player? 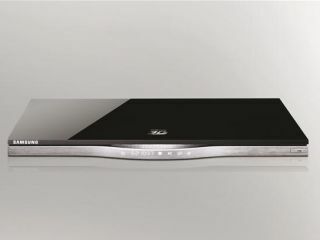 Samsung is showing off what it claims is the world's thinnest 3D Blu-ray player, the BD-D7500, at CES this week. Measuring just 28mm tall, the BD-D7500 offers 2D-to-3D conversion, HD up-scaling, Wi-Fi connectivity and a super-speedy three second start-up. Samsung is very hot on the connected TV this year, and its Blu-ray players are going the same way, with DLNA connectivity and wireless links to compatible TVs and routers within one foot of the BD-D7500. The other models in the 3D Blu-ray range unveiled at CES are the D7000 which has a hidden pop-up disc loader. Much like the CD players of the nineties, the loader pops up from the centre of the dinky device. It's not all swanky loading with the D7000 though, the player also offers 2D-to-3D conversion, HD upscaling, three second start-up time and Wi-Fi. Samsung has also considered the budget-conscious 3D fan and come up with the D6500. The entry-level model offers full HD 3D as well as a range of connected features via Wi-Fi.